View the full video tutorial online (1 hour and 45 minutes). Found on top of home page of Land of Odds-Be Dazzled Beads. In this class, I discuss critical choices jewelry designers need to make when doing craft shows. That means, understanding everything involved, and asking the right questions. Doing craft shows is a wonderful experience. And you learn a lot about business and arts and crafts designing. Jewelry design is a life lived with wearable art. My name is Warren Feld. And I am here to share some of my life experiences and insights with you about beading and jewelry making. It is very important for anyone thinking about selling at craft shows, festivals, markets or similar settings to be smart about it. Many years ago, I started my business with my partner Jayden, by doing flea markets and craft shows. Eventually, our business evolved into one store, then a second store, and an online business. But you never forget your roots. You can learn a lot of good business tricks and find out about a lot of good resources if,… And that’s a big, “IF”! you know what you are doing. All too often, jewelry designers who want to do craft shows, have not done their homework. They have not researched and evaluated which shows to do, and which not to do. They have not figured out how best to set up their booths and displays. They are clueless about what inventory to make, and to bring, and how to price it. They are unprepared to promote, to market and to sell. I developed this online tutorial to help prepare you for doing this kind of craft show homework. In fact, I go over 16 lessons I learned for successfully doing craftshows. There are two groups of lessons. First, I discuss lessons about finding and selecting craft shows, and determining how well your business will fit in. In the second group of lessons, I discuss how to promote and operate your business at these craft shows. Last, I offer some final advice. At the end of the tutorial, I have a list of resources for you to explore in more detail. 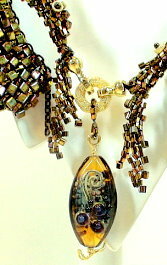 at the top of the Land of Odds-Be Dazzled Beads website. We are so Excited to offer an Awesome, fun Enrichment-Travel opportunity! Find out more about our YOUR WORLD OF JEWELRY MAKING CRUISE!